With Preceden you can have one event start when another one ends. We call these events dependents because they depend on another event to determine their dates. Let's pretend that you're a software developer and are using Preceden to plan the release of a new project. In one of the layers you want to have two events, Alpha and Beta, representing where you and your team are at in the development process. 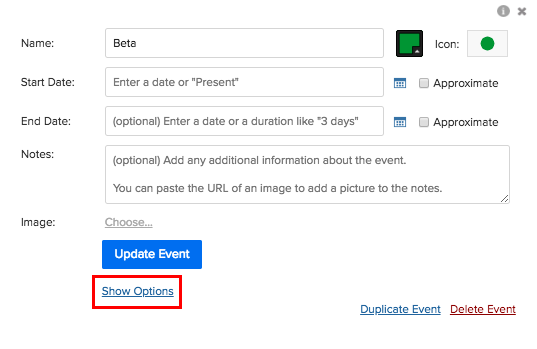 Fixed start and fixed end date - Add an event with a start date of June 2018 and an end date of November 2018. Fixed start date with a duration - Add an event with a start date of June 2018 and an end date of 6 months. Dependent start date with a fixed end date - Make Beta a dependent of Alpha and set the end date to November 2018. Dependent start date with a duration - Make Beta a dependent of Alpha with an end date of 6 months. 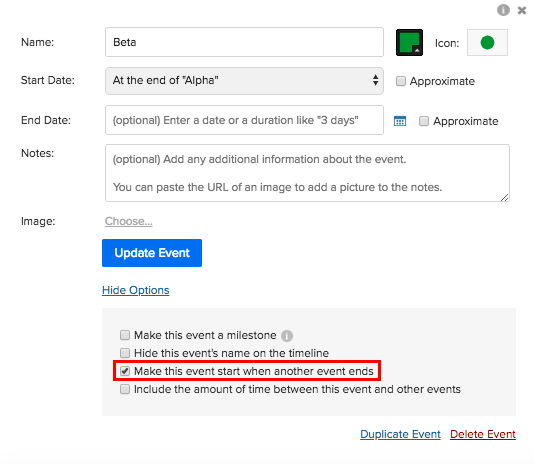 My preference is the last option because you don't have to specify the actual start date of the event (and it will automatically change if you ever change the date for Alpha, the event it is dependent on) and if you specify the duration then the end date will automatically be calculated whenever the start date changes. In the example above, Beta depends on Alpha. What happens if you delete Alpha? If you delete an event that has dependents, Preceden will update the dependents to reflect the deleted-event's end date. 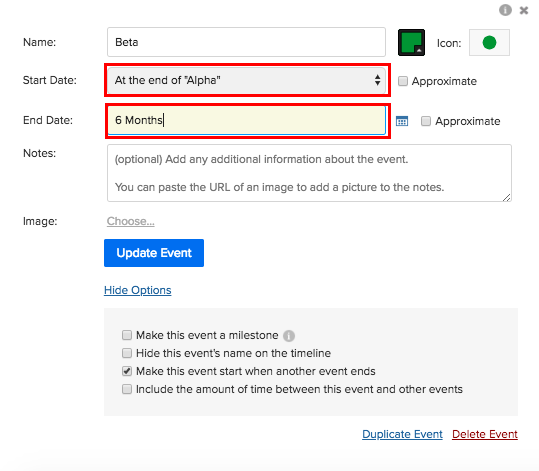 In this example if we delete Alpha, then the start date for Beta would be set to Alpha's actual end date, July 1, 2018.